S.E.E.4Vets presented a $12,814 check this week to MCC to help fund new Veterans Centers on campuses in Bullhead City, Kingman and Lake Havasu City. The MCC Kingman Veterans Center was created fall 2018. It was so successful that the Lake Havasu City campus and Bullhead City campus Veterans Centers were added spring 2019 with full support from S.E.E.4VETS. All of the colleges Veterans Centers are located in the campus libraries, where students have easy access to many resources including the MCC Student Success Centers and tutors. First-time ever Summit with Arizona community colleges and Nevada Truckee Meadows Community College was a success. The presentations were spot on to highlight the impact the S.E.E.4VETS Grants are having on student veterans. The testimonial stories and testimonies themselves, clearly pointed to S.E.E.4VETS doing good and memorable work. In addition, college representatives suggested ideas for S.E.E.4VETS to consider going forward. 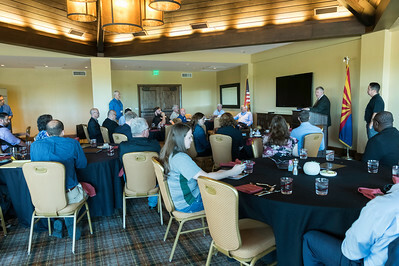 Summit was held Sept. 26, 2018 and total attendance, including nine board members stood at thirty-four. S.E.E.4VETS established an S.E.E.4VETS Veterans Legacy Endowment Fund at Coconino Community College on September 7, 2018. After the Foundation breakfast, the $15,000 check was presented to the Foundation leadership and Dr. Colleen A. Smith, President of Coconino Community College (seated). As the history books reflect on the post 9/11 era, service members and their families will be remembered as American patriots whose sacrifice and dedication to the values of our country will be singled out and revered for a long time. Please click on video produced by Rose+Moser+Allyn PR. Rusty Findley, Vice Chairman of the Board, USAF, Lt.Gen.(Ret.) and Ray Torres, Chairman of the Board, S.E.E.4VETS had the privilege and honor to present a $12,814 check to Diana Stithem, Interim President, Mohave Community College (MCC) to help fund new Veterans Centers on campuses in Bullhead City, Kingman and Lake Havasu City. The MCC Kingman Veterans Center was created fall 2018. It was so successful that the Lake Havasu City campus and Bullhead City campus Veterans Centers were added spring 2019 with full support from S.E.E.4VETS. Please click on video produced by MCC. Rusty Findley, Vice Chairman of the Board, USAF, Lt.Gen.(Ret.) and Ray Torres, Chairman of the Board, S.E.E.4VETS had the privilege and honor to present a $5,000 check to Dr. Karin Hilgersom, President, Truckee Meadows Community College (TMCC) to fund the Veterans Upward Bound program (VUB). Please click on video produced by TMCC. S.E.E.4VETS has been supporting veteran students at Glendale Community College (GCC) since fall 2015. The math department at GCC offers MAT 108, which is a tutored-structured math class taken concurrent with a regular math course. This type of course is not GI Bill eligible, so it becomes the responsibility of the veteran to pay for the class. With the S.E.E4VETS scholarship, however, the course is paid for. Please click on video produced by Maricopa Colleges TV.